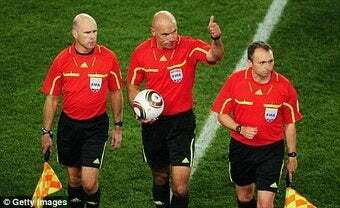 Howard Webb's dream of officiating a World Cup Finals match will come true tomorrow. But to hear his Missus tell it, dream could morph into nightmares of Coulibaly proportions for Espana or Holland. Sayeth Kay Webb of Rotherdam, U.K., "I don't know how he does it. He can't take charge of his own children. I don't know how he manages it on a football pitch." There you have it, a father of three will be in charge of a field of 22 children as an audience of 500,000,000 children watches worldwide (My-giddy-self included). So, FIFA has that going for it. Photo of Webb (center) from dailymail.co.uk.